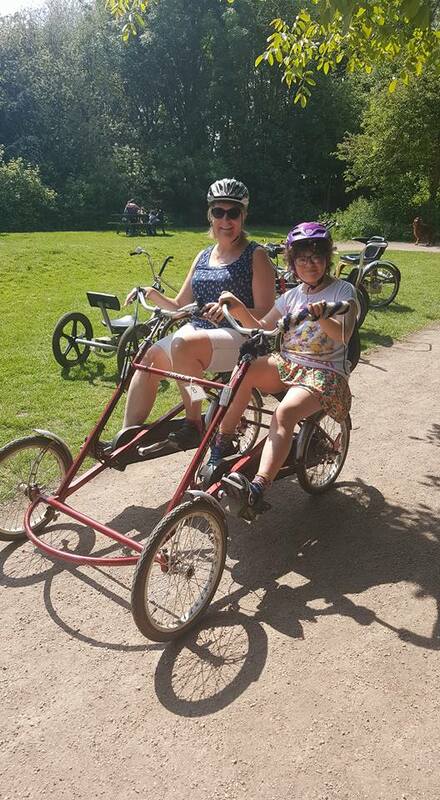 You Can Bike Too is an amazing, award-winning all-ability cycling project at Milton Country Park, managed by Cambridge Sport Lakes Trust and supported by our awesome, experienced instructors and volunteers. This year alone we've already had some fantastic firsts, with children and adults enjoying the great physical and mental health benefits of getting outdoors and cycling, many of whom never thought they could! Every week many families with a range of ages and mixed abilities, enjoy time and an activity that they can do together, which we're often told is a rare and special treat for all of them. We've had the slow progression of young people going from being too overwhelmed to leave the car park who are now cycling the park unsupported and grinning all the way, to children with mobility impairments peddling away from their parents on their first ever ride, much to their amazement! We've ridden wheelchair users in our specially adapted wheelchair bike with people who don't need to speak to share their thrill at travelling through the park on a bike, and have cycled a stroke survivor who had been a keen cyclist and never thought he would ride again: 'this feel like hope, to me' he said as he pedaled with us on our side-by-side bike. These are the reasons why we are so proud to be a part of this project and why we ask you to vote for You Can Bike Too for Mick George's Bag of Gold competition! Funds will allow us to reach more people by covering extra summer sessions, giving families a chance to experience a rare weekday outdoor activity for all the family!